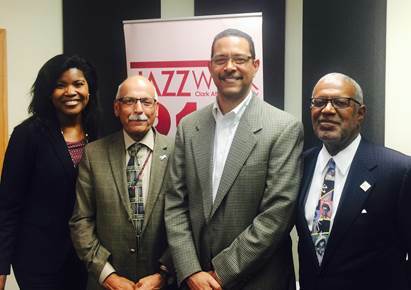 September 21, 2017 — As a part of National Prostate Health Month, Dr. Darrell Carmen appeared on the season premiere of “Your Health Connection” on Jazz 91.9 WCLK to discuss the pervasive disease. The hour-long show was hosted by The Center for Cancer Research and Therapeutic Development (CCRTD) and Paula Gwynn Grant and featured Dr. Shafiq Khan and Mr. Rudy Morgan. Dr. Khan is professor and Director of the CCRTD at Clark Atlanta University, and Mr. Morgan is a prostate cancer survivor. During the show, Dr. Carmen shared his vast expertise in preventing, diagnosing, and treating prostate cancer. He also took calls from listeners who had questions about the disease. If you didn’t get a chance to listen live, click the link to hear Dr. Carmen on WCLK’s “Your Health Connection” show!